Hello Bible-study teachers, small-group leaders, and Christian mentors! Refine your leadership and teaching skills with these practical tips. Browse the site for resources for your students and personal enrichment, then come back for teaching tips and solidarity. The surprising truth is that many unbelievers who object to the Bible have not actually done their own research. They claim to be critical thinkers who don’t just fall for anything when in reality they are simply repeating objections to the Bible that they have heard from others and that sound plausible. Let’s challenge this distrust in the Bible first within the church and then outside of it. The idea that someone just made up a bunch of stories and put them together in a book is actually one of the silliest objections to the Bible I have ever heard. The Bible was written over a long span of years and archeologists can confirm that fact. The Bible is at the very least a historical book. If you don’t trust what’s written here for the reason that someone may have just made it up, you should have the same objection regarding every other piece of history that has been passed down orally or in writing. Take a good look at Scripture and notice that it is clearly written by a number of different people, in different writing styles, and over the course of many centuries. Archeological evidence has been found for much of the Bible’s accounts. One thing is clear: One person or group did not sit down one day and just make it all up. Was the Bible Simply Written by Men? There is a rumor roaming around, claiming that the Bible contradicts itself. Interestingly enough, when you ask someone who makes this statement to give you an example, usually they can’t. They have simply heard this about the Bible and are repeating it. There are certain things in the Bible that may seem like a contradiction if you don’t have any understanding of the book. Of course, those who reject the Bible altogether likely have little understanding of it. An example of something that may look like a contradiction at first glance is Jesus’ Sermon on the Mount. Here, Jesus takes Old Testament laws and regulations and seemingly changes - or contradicts - them. It could easily look that way to someone who does not understand the context. In fact, Jesus does two things: 1.) He came to fulfill the Law. That means, due to His sacrifice on the cross for our sins, we are no longer required to keep the Law. 2.) He is getting back at the heart of the issue and calling His followers to a higher standard. Jews at the time had become very legalistic, sometimes keeping the letter of the Law while completely missing the purpose of it. Jesus raises the bar and lets us in on the heart of God during this famous sermon. So if somebody tells you or the ladies in your life that the Bible contradicts itself, ask them to give you an example. If they do, you may be surprised how easily you can see and explain why what looks like a contradiction at first glance actually is a consistent part of God’s message. If you don’t have an answer, always remember that, “Let me look into it,” is still an acceptable response. Of course, then do your research and get back to them. 1 Peter 3:18 Does the Bible Contradict Itself? While we now understand these basic truths about the earth and the sun, there are plenty of disagreements that the average secular scientist has with many Christian scientists. The truth is there is a huge difference between Christians today and the religious leaders who opposed the finding of a spherical earth moving around the sun. Christian scientists have done their own thorough research. They have found evidence of many of the Bible’s accounts and claims. I will not deny that believing in a six-day creation by an invisible God takes at least a portion of sheer faith. So does believing in the many miracles we read about in the Bible. However, when you do your research, you’ll be surprised to see how much scientific evidence actually supports the Bible. Does Science Conflict with the Bible? Stay calm. There is no need to get flustered or offended. Realize that this is simply where this person is at on her journey with God. They may be opposed or questioning right now, but God may have a surprising plan for their future. Engage in a conversation. 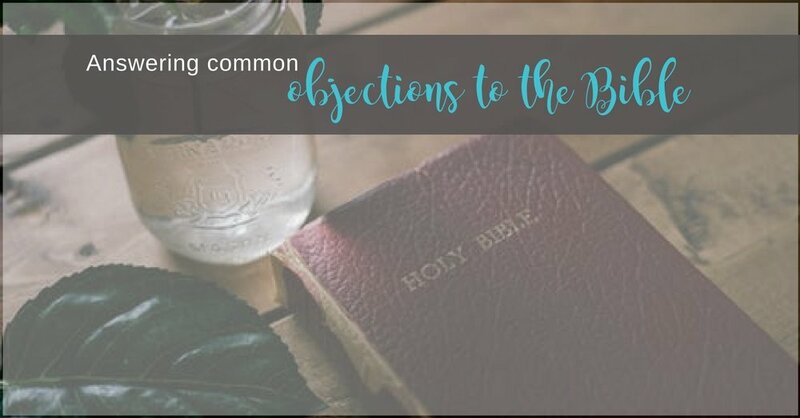 These objections can be powerful opportunities to talk about faith, share why and what you believe, and challenge the other to keep wrestling with faith questions. You don’t have to defend God. He can take care of Himself. Sometimes believers feel like they need to get offended on God’s behalf and challenge their opponent with a clever come-back or stern warning that hell is awaiting them. I don’t believe this is at all how God wants us to respond. Speak the truth in love, my friend. I’m curious: What objections to the Bible have you heard from either believers or unbelievers? What struggles do the ladies in your small groups and Bible studies have when it comes to fully trusting the accuracy of God’s Word? Please, share with me in the comment section. I would love to turn these questions into “Mini-Tip Monday” articles to help more ladies be confident that the Bible is our trustworthy guide to life.